Dr. Evil s back. 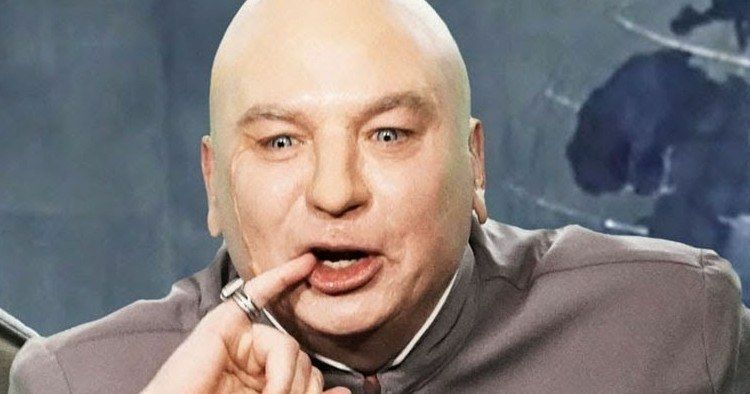 Mike Myers recently teased that we would be seeing the Austin Powers villain show up in the near future and the actor has delivered on that promise. Myers suited back up as Dr. Evil on the eve of the midterm elections for a sketch on The Tonight Show, in which, he announced that he’s running for Congress, in Rhode Island of all places. Jimmy Fallon and Dr. Evil enjoyed some playful banter back and forth during the sketch. When Fallon asked if it was indeed Dr. Evil, the actor joked, “No, it’s white Cory Booker.” Mike Myers also joked that he’s running in Rhode Island because that’s where his secret volcano lair is located. He also stated that he’s running as an “Eviltarian,” then proceeded to hold up a red hat reading, “Make America Evil Again.” When asked why he’s running, Dr. Evil made the simple point that evil is in right now. This isn’t the first time that Mike Myers has reprised his role as the iconic villain outside of the movies. Just earlier this year, Myers appeared on Fallon’s show as well in a sketch where he was fired by President Trump. Myers also played the role in a Saturday Night Live sketch back in 2014. This sketch further revealed that Dr. Evil has a five-point plan, should he get elected, which starts with destroying one of America’s favorite snack foods. Dr. Evil continued on, rounding out his plan. It also involves increasing the amount of time before you can skip an ad on YouTube, legalizing weed because he likes to get “sticky on the icky” and finally, changing the national anthem to something a bit more, evil, in the form of the Baby Shark Dance. This annoyed Jimmy Fallon a great deal, but falls in line with the villain’s obsession with sharks. The sketch concludes with what seems, at least at first, like a genuine, heartfelt plea to voters. Mike Myers recently revealed that Austin Powers 4 is still in the works and is looking good, but getting the movie ready is going to take some time. Myers also previously stated that the movie would possibly be centered on Dr. Evil, as opposed to the iconic groovy spy. Until that movie finally gets going, these little appearances elsewhere in pop culture are going to have to do. Be sure to check out the full sketch from The Tonight Show Starring Jimmy Fallon YouTube channel below.